I never understood why Americans are against hatchbacks. My family and I travel often to other countries, and in Asia and Europe, hatchbacks are the norm. Even in Australia and New Zealand, hatchbacks generally sell more than sedans. 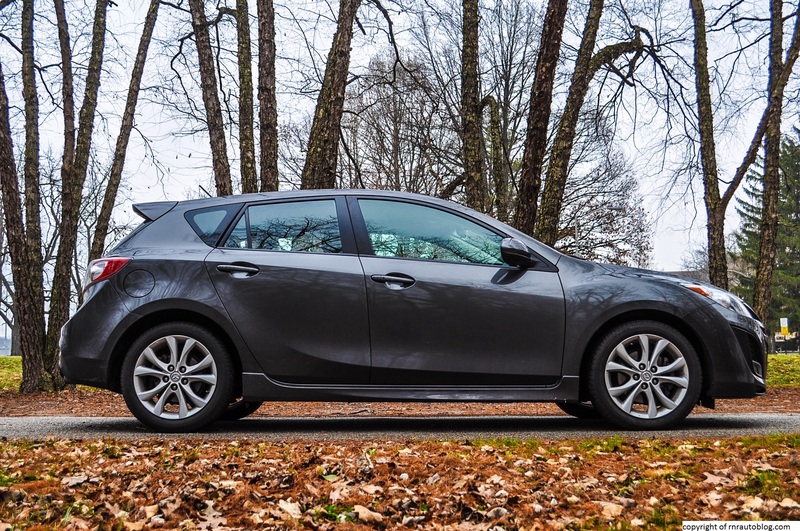 So why does America have an adverse reaction to hatchbacks? I have no clue. One time, in a store parking lot. I pointed out a nice Audi A3 hatchback, and I said to my sister, “Look at that A3, isn’t that a sweet ride?” Her reply? “Ew. It’s a hatchback.” I am baffled. 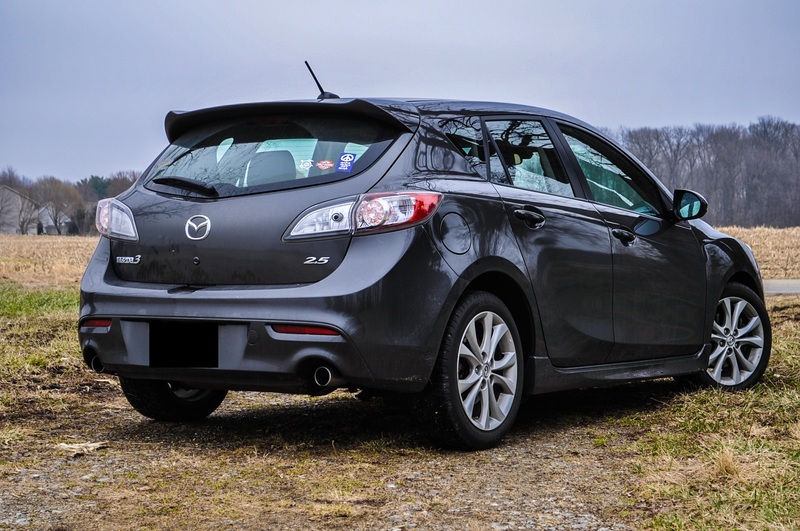 Logic dictates that we should prefer hatchbacks over sedans because they provide better cargo space and more versatility and in some cases, they tend to look better than their sedan counterparts. 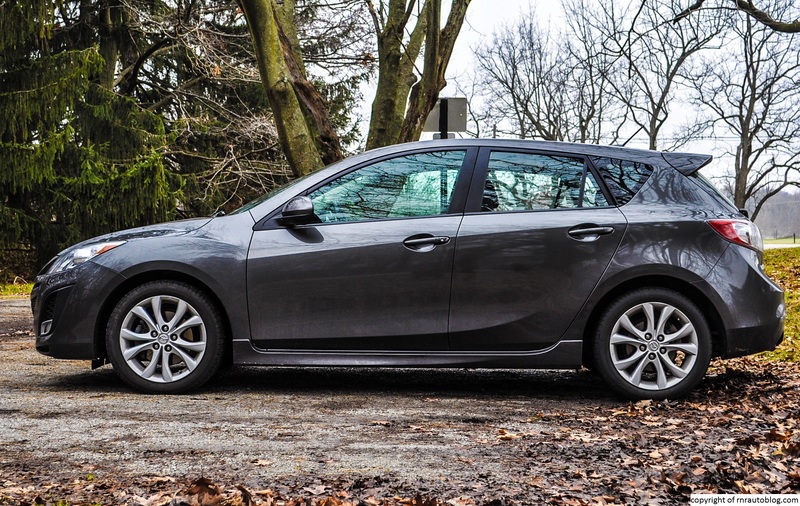 Such is the case with the second generation Mazda3. 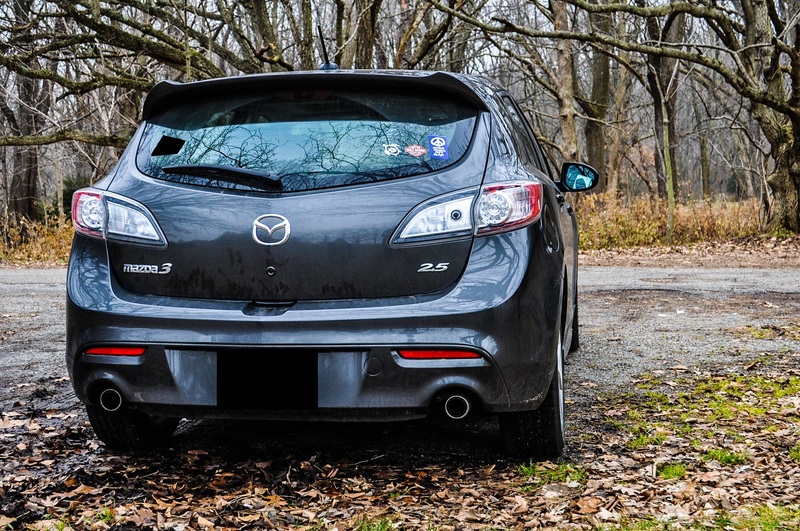 Replacing the Protege (called the Familia overseas), the 2004 Mazda3 was the start of a new era for Mazda. 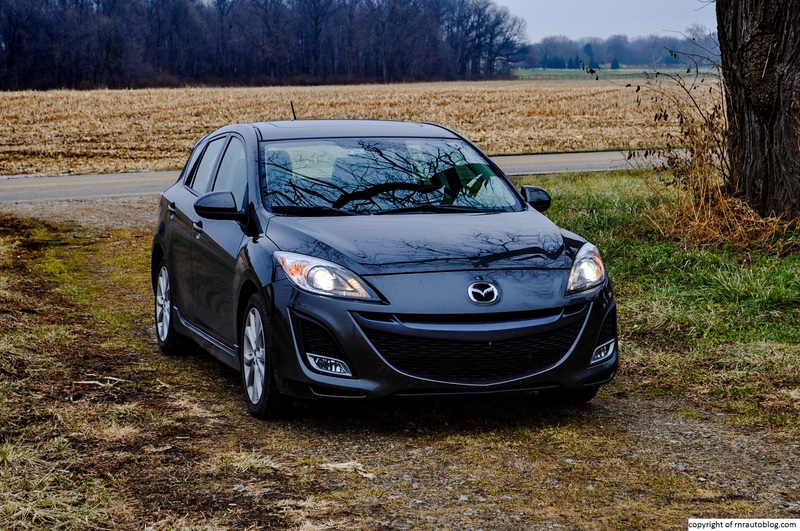 No longer a company of humdrum and ordinary vehicles, Mazda placed emphasis on sporty driving experiences and styling which started with the first 3. 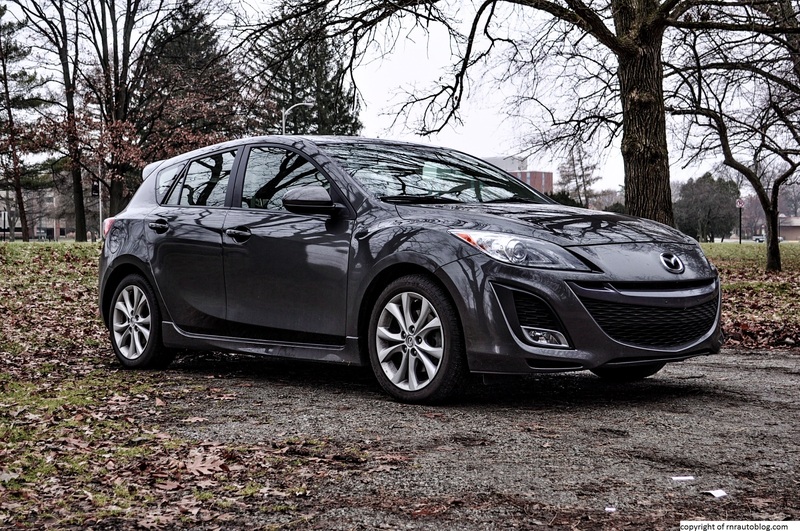 The first generation Mazda3 was a blistering success, and it was the car that pulled Mazda out of obscurity. It was renowned for its blend of enjoyable handling, quick performance, excellent fuel economy, and its design. 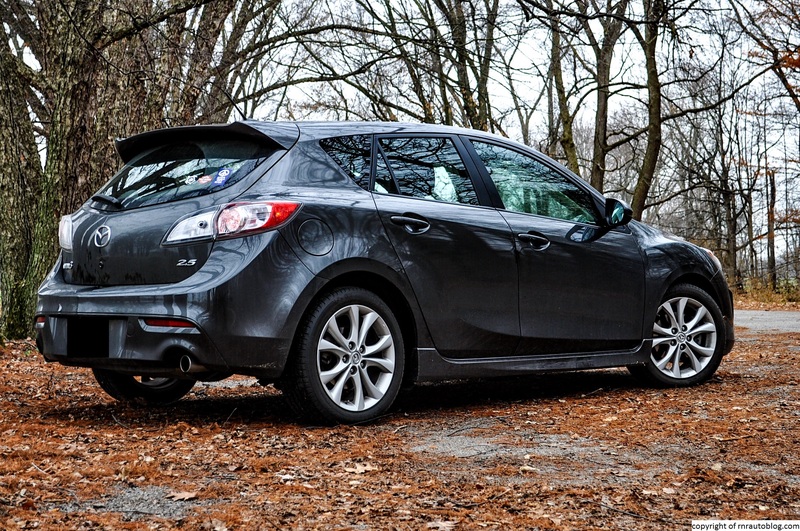 I reviewed two first generation 3s, the high performance hatchback, Mazdaspeed3 and a sedan. I was impressed as they provided the driving experience of a BMW but for half the price. In 2009, the second generation debuted as a 2010 model. I also had the opportunity to review one, but it was an automatic transmission sedan. However, this car is a hatchback with a manual transmission. 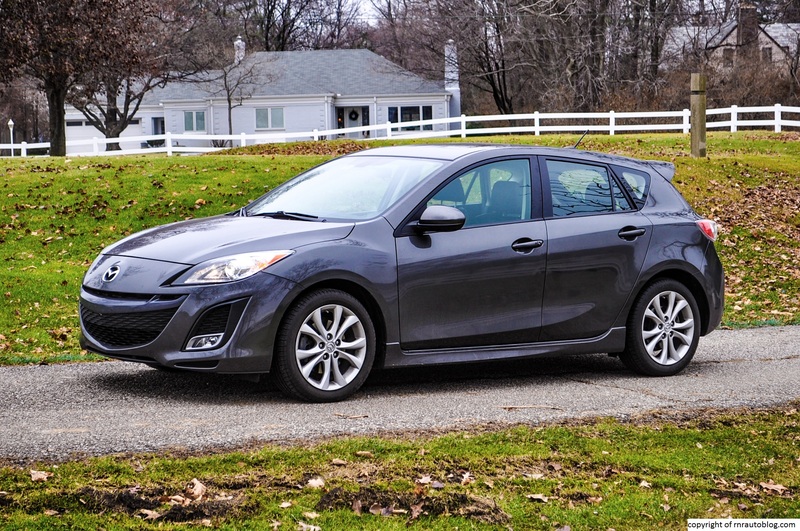 Which begs the question; would I like the hatchback configuration better than the sedan? 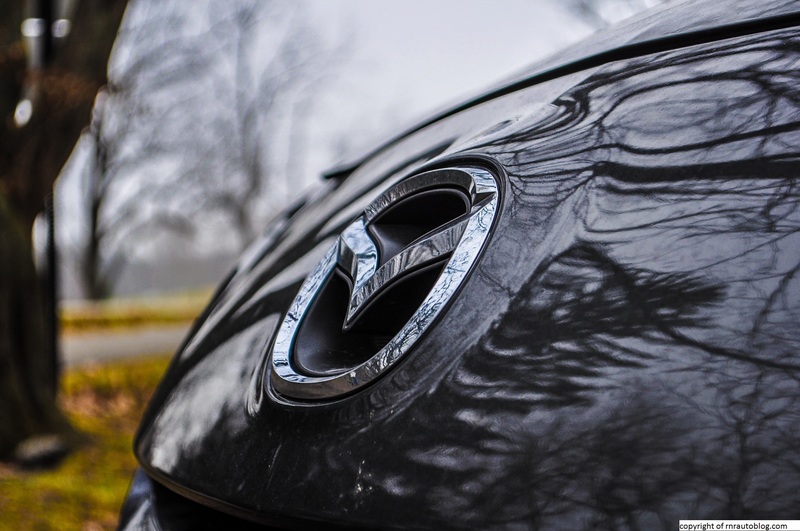 This generation utilized Mazda’s design language, “Nagare”, which consisted of surfacing (swoopy lines and curves) on the sides and a large open mouthed grille. 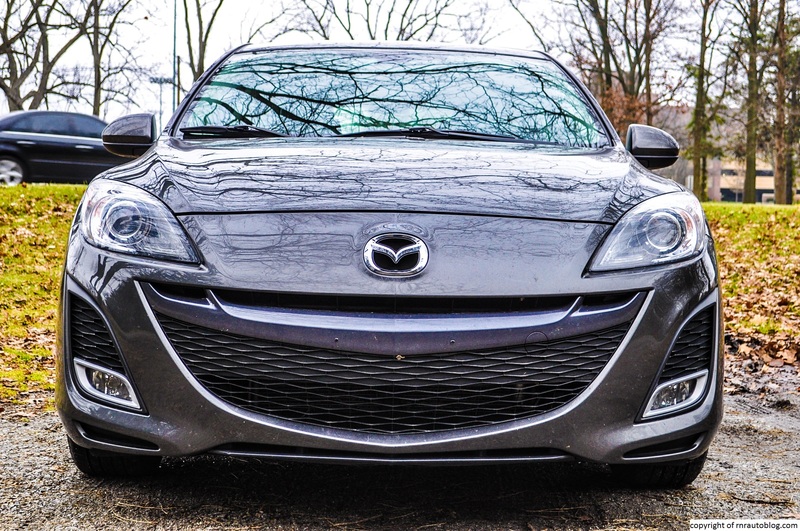 The large open mouthed grille is what prompted Mazda to discontinue the Nagare design language for its current lineup. 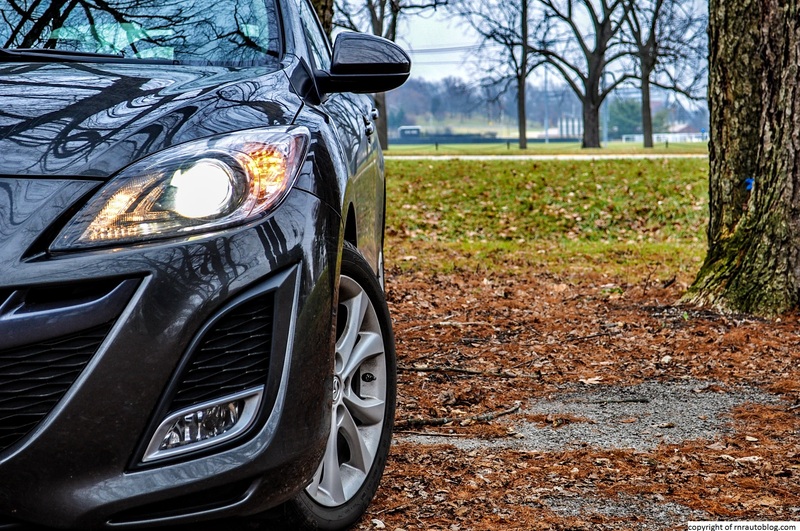 The reason is that when you look at the car head on, it looks like it is grinning at you. While the second generation 3 looks very similar to the previous model, it is obviously a bigger car, and as such, the styling that worked on the previous model does not fare as well on this. The 3 is not ugly at all by any means, and it is still a good looking car compared to its rivals, but it does appear overwrought from some angles. The front has the controversial grin, and everything is enlarged making this car seem bigger than it really is. The sharp headlights give it a sporty appearance, but as I look at the car, I cannot help but think, “Wipe that smirk off your face.” The swooshes of the Nagare design language is present, especially on the side profile. The bulging fender fares give it some substance to its sporting tones. I like the distinctive character line that starts at the door and reaches the taillights. But what strikes me as odd are the rear fenders. The rear fenders look like they have been sucked in. As for the rear, this is where it is really lacking compared to the previous generation. Whereas the previous generation had distinctive and beautifully detailed taillights, the taillights are bland and look rental car spec. Another feature I do not like is the rear bumper. It just seems over styled with its wraparound design. The dual exhausts are a nice sporty touch though. The interior is a nice place to be. It looks futuristic, and while it appears cluttered at first glance, it’s simplistic. 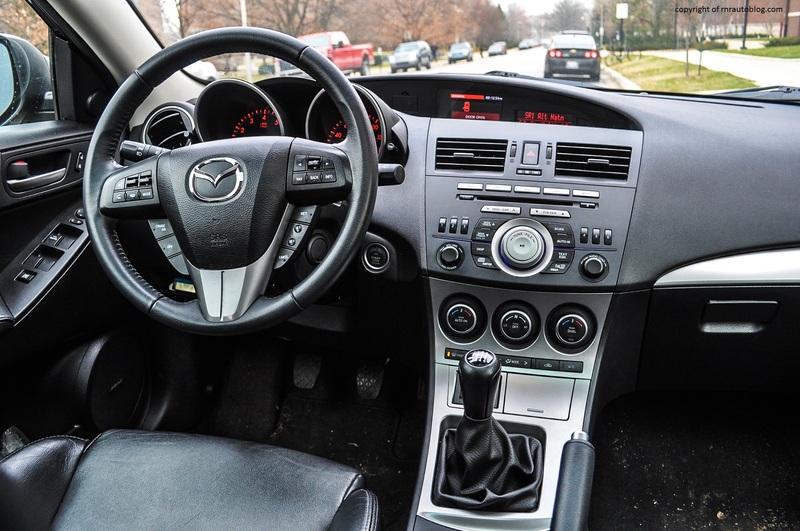 Fortunately the red gauges and the blue radio lighting, a former Mazda trademark, remain. 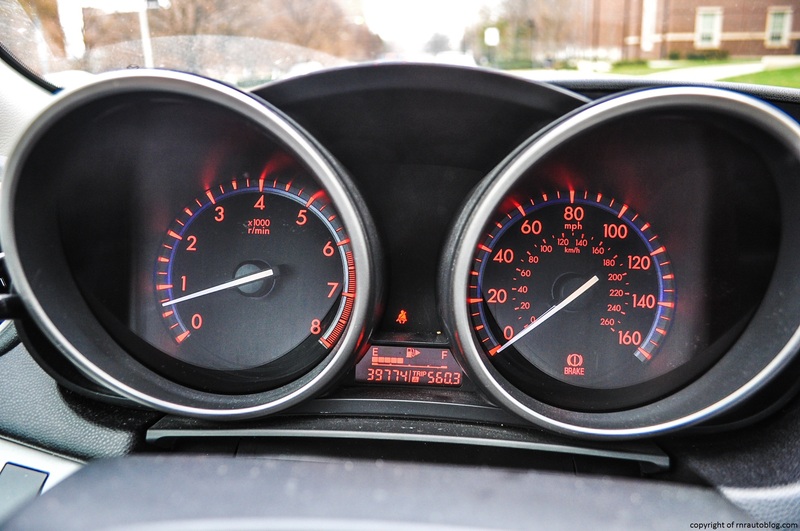 The red gauges with a blue outline look superb at night. Its ability to carve corners with so much enthusiasm is nothing short of astonishing. The handling is sublime as the car never feels like it is in pain from enthusiastic driving. Even though the steering is light, the feedback is excellent. 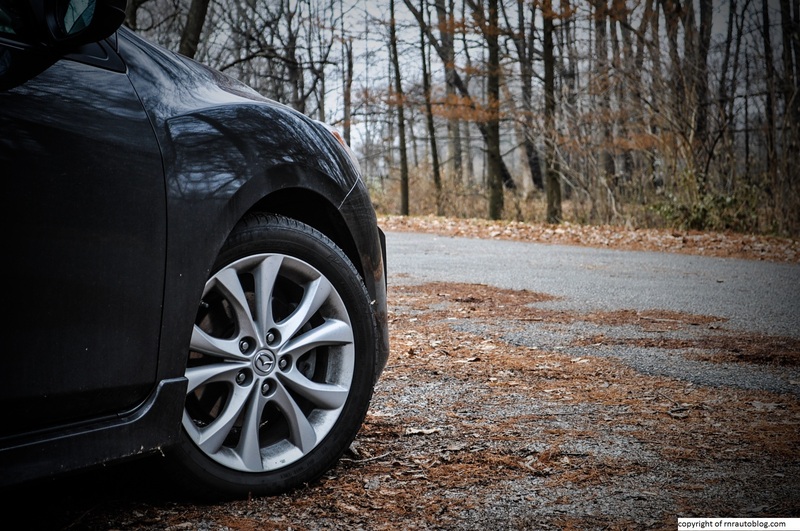 The connection between the driver and the car is heightened because you feel more involved in the process since you know what the front tires are doing. 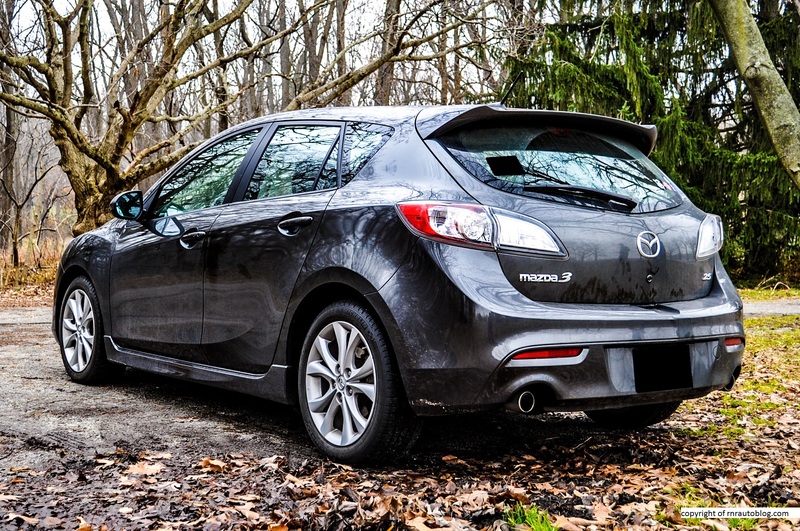 The absence of body lean and grippy tires make the Mazda3 a joy in corners. Although it has a slight tendency to understeer when going fast, it regains its composure easily. The ride is taut as road imperfections permeate the cabin, but they are muted. You do feel bumps, but it never becomes uncomfortable. 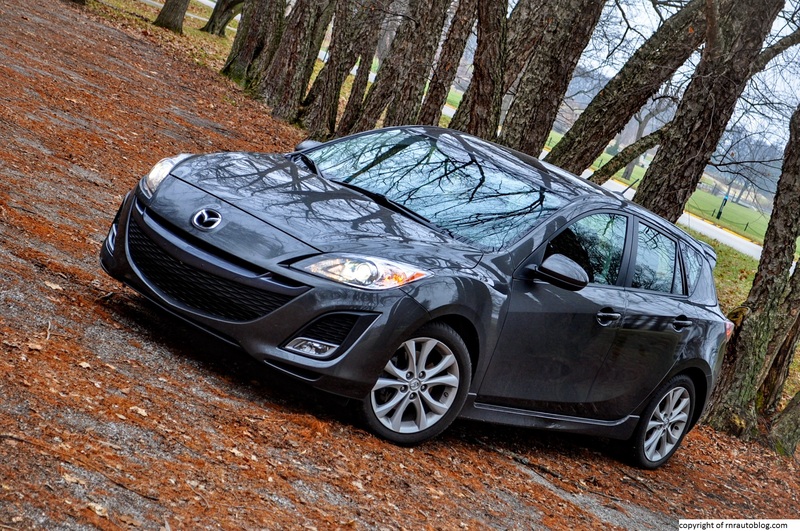 Mazda3s with the 2.5 liter four cylinder engine are renowned for their relatively fast acceleration and power. 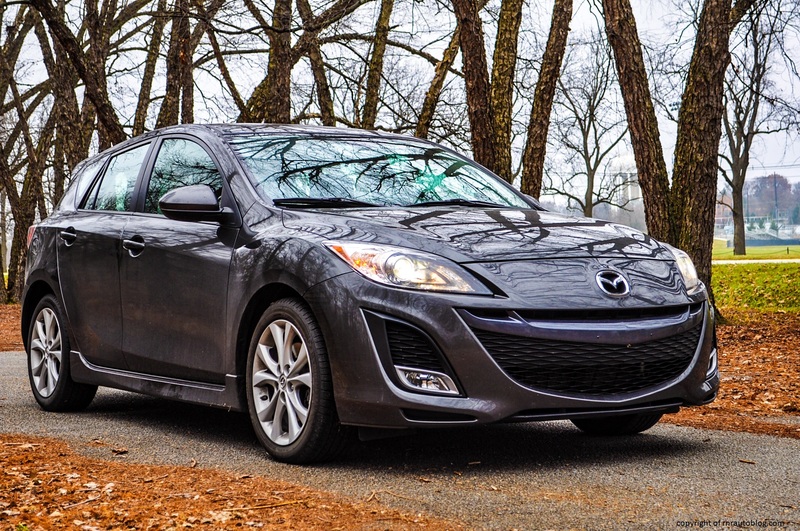 Even though the 167 horsepower rating may not seem much, the engine proves that there is some truth to Mazda’s tagline, Zoom-Zoom. The four cylinder is fast, and it is relatively easy to peel the tires, even with the traction control on. It has impressive grunt, and while it feels flat at low revs, give it some gas and enjoy the ride. The four cylinder engine has enough torque that you can cruise on the highway easily in sixth gear. Speaking of gears, the transmission of this car is a six speed manual transmission. 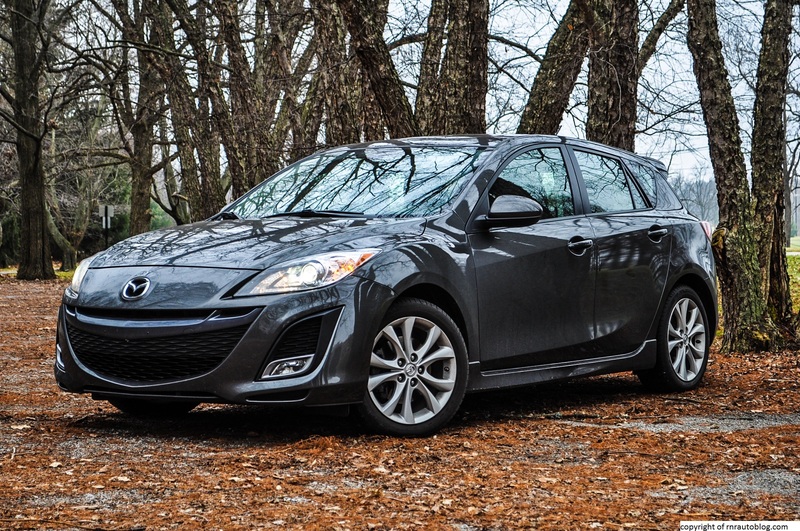 Further complementing the Mazda’s sporty character, the six speed is a joy to operate with smooth and light shifts. The shifter is notchy around 1st gear, but it is manageable. The clutch has ideal weighting, and it is easy to modulate although a bit more feel would be welcome. 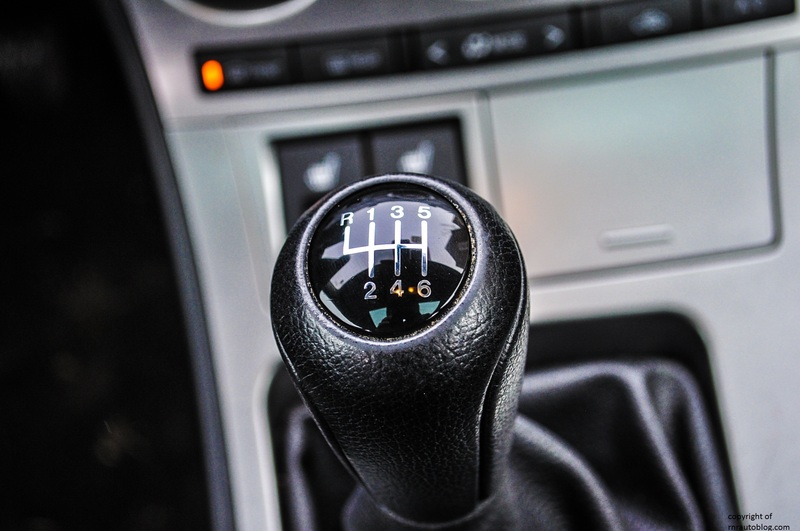 A five speed automatic transmission was available as well (A six speed automatic transmission arrived in 2012), but honestly, I would stick with the manual for this car. A 2.0 liter four cylinder is available with both manual and automatic transmissions. 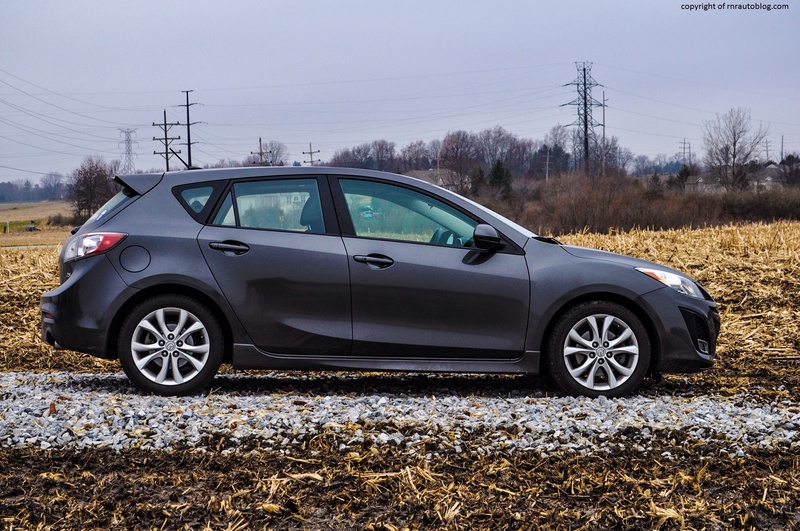 According to the EPA, fuel economy combined is 24 mpg for the 2.5 manual which is decent but not the best, considering its rivals like the Honda Civic and Toyota Corolla get at least 30 mpg. 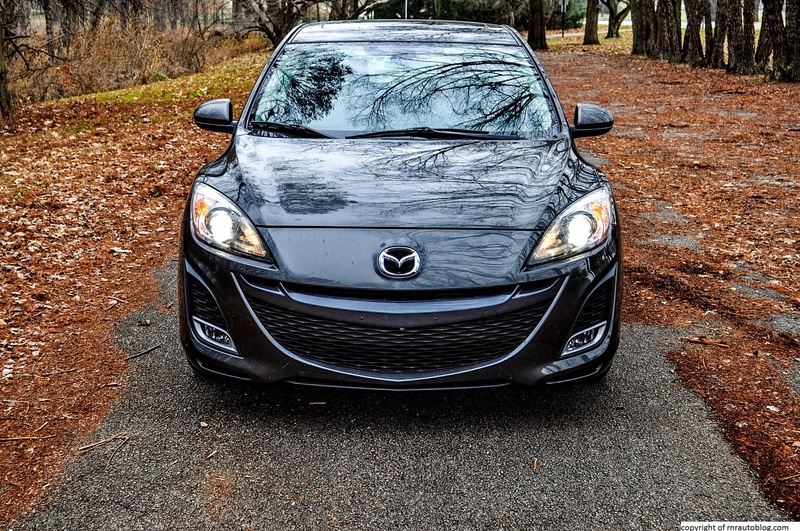 While I was driving this car, I was thinking, “Now I know how Mazda saved weight on this car. 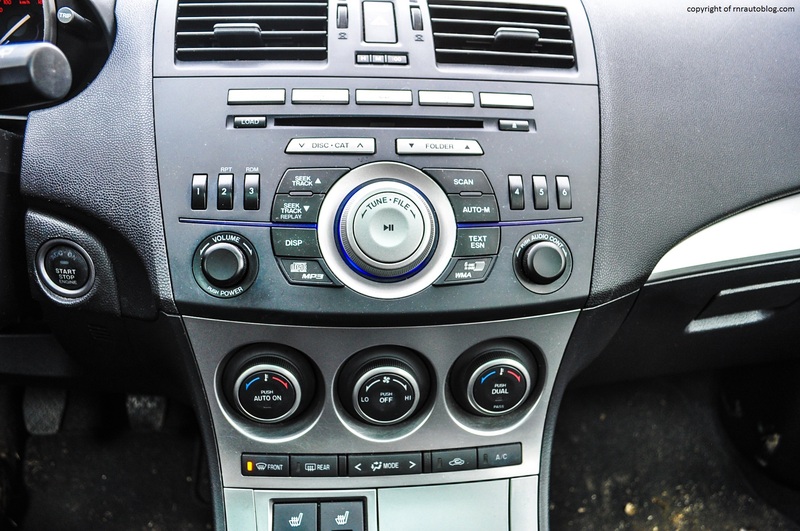 They skimped on the sound deadening!” There is considerable road noise, especially at highway speeds. However, the engine is refined and it sounds great when revved. The fit and finish is up there with the very best. Although some cheap feeling plastics are present, the rest of the cabin feels of high quality with decent attention to detail. Most drivers should be able to find a decent driving position. This being the top of the line Grand Touring model, it comes fully loaded with amenities, including a leather interior and navigation. 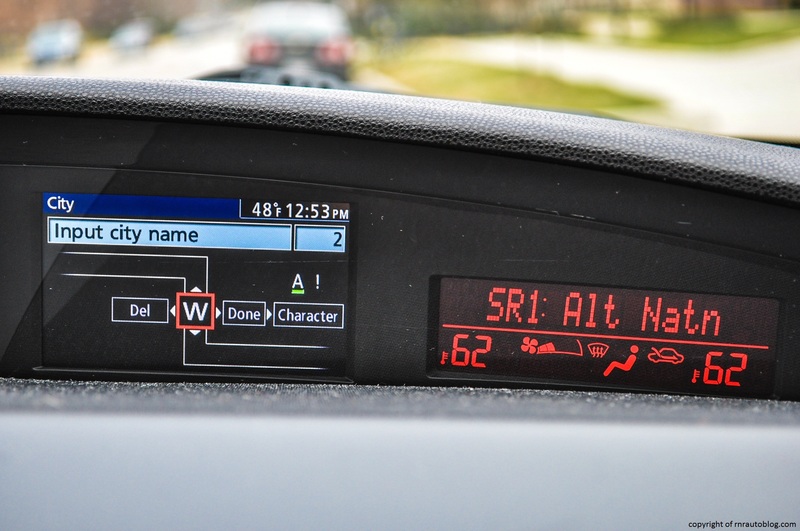 The controls are easy to comprehend, but the navigation system is a struggle. For whatever reasons I cannot fathom, Mazda thought it was okay to make the navigation screen tiny and recessed all the way back in the dash. To make it worse, there are no direct keys for the navigation system where you expect them to be. The buttons for the system are on the steering wheel. You actually have to enter your destination using the Up and Down keys. In order to enter an address, I have to shift up or down to select a letter, which becomes a chore. The nicely contoured seats fit you well, and I appreciate their bolstering. The front feels spacious, the rear less so. The rear is tight, even for two adults, and legroom is meager. It makes up for this with its hatchback versatility. 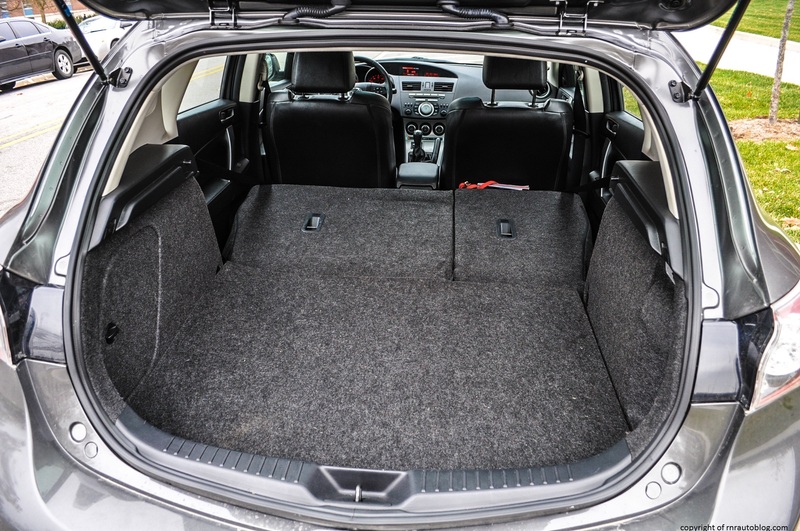 The cargo area is large for a small hatchback, and can be expanded with the fold flat rear seats. As for visibility, it could be better but is tolerable. 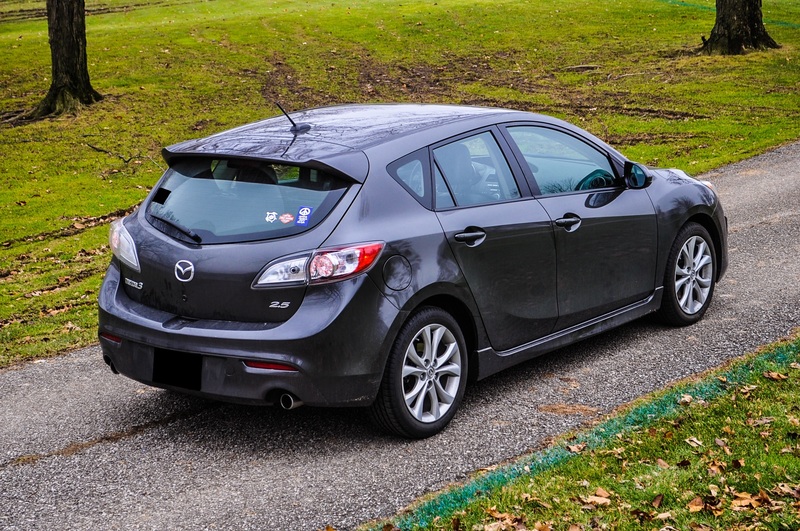 After reviewing this car, I still do not understand why we American have a strong distaste against hatchbacks. 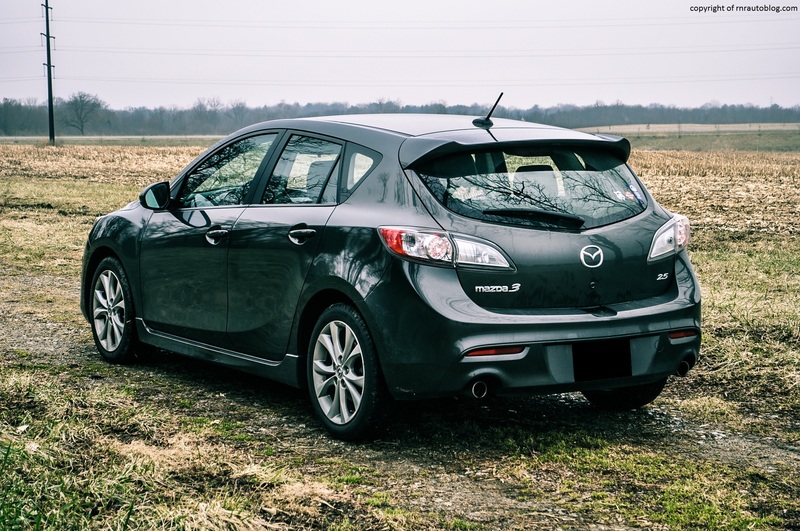 For the average consumer, the Mazda checks off most boxes: it drives well, versatility and practicality are above average, fuel economy is decent, it is comfortable inside, and it is affordable. Generally, I would choose the sedan configuration over the hatchback configuration, but this car is giving me doubts. For some reason, I enjoyed this more than the automatic sedan that I reviewed. Yes, this has a manual transmission which makes this car vastly more enjoyable to drive, but not only that, I felt like I was getting more for my money with the hatchback style. For the same price, you get more cargo space and in my opinion, better styling. 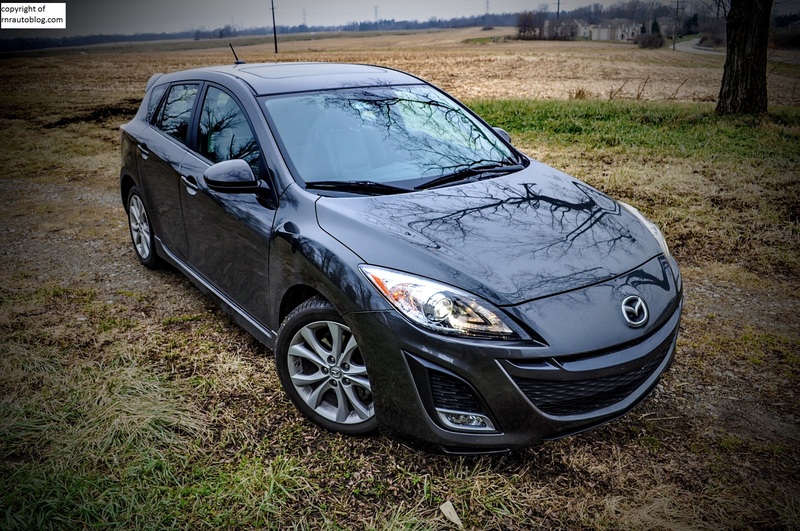 Mazda is my favorite automotive manufacturer because they do not compromise on driving enjoyment in their lineup, and the second generation Mazda3 is a prime example.